510 units. 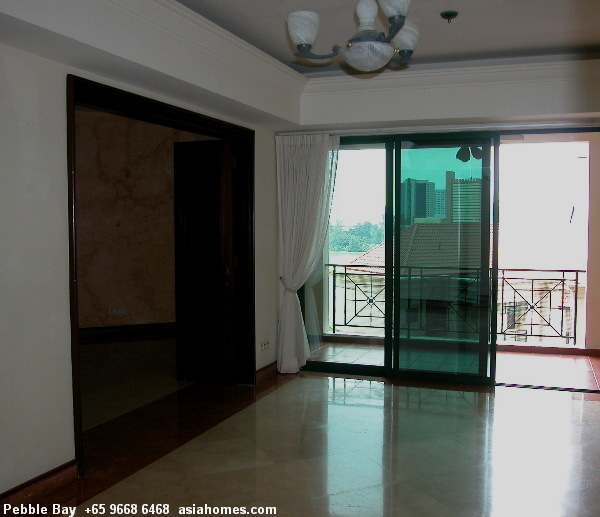 130 - 137 Tanjong Rhu Road. The Central Business District, Orchard Road are just 5-minute drive away via the East Coast Parkway expressway and Nicoll Highway. Panoramic waterfront views for most units. 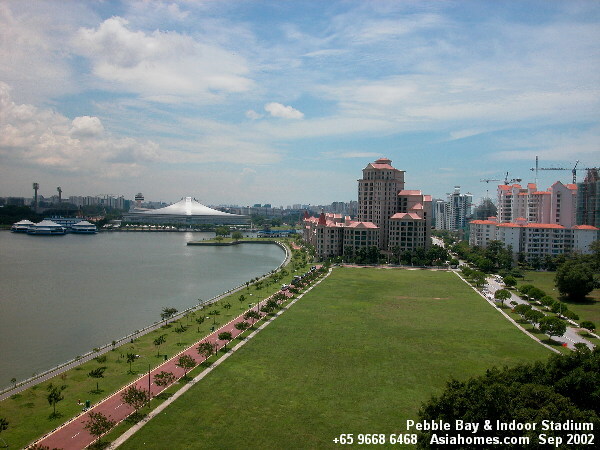 Easy access to recreational facilities in the East Coast Park and beaches. Within walking distance to The National Stadium, Indoor Stadium, Kallang Tennis Centre and Kallang Theatre via a suspension bridge. A commercial village with food kiosks and outdoor shopping by the Suspension Bridge is completed in 2001. Predominantly Caucasian expatriate community and many children. Swimming pool. 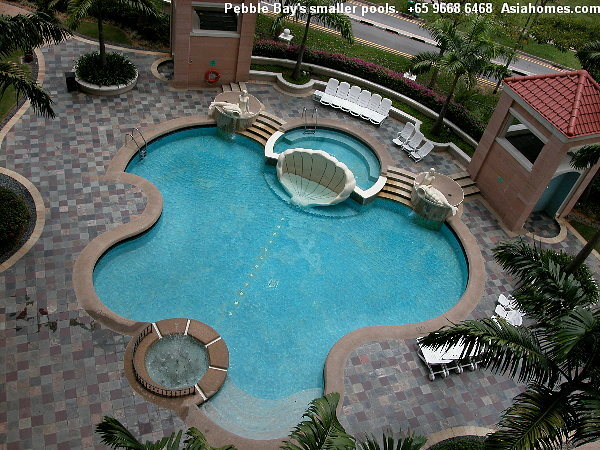 A Lagoon Pool, a wading pool, spa and bubble pool, two tennis courts and two squash courts. A golf driving range, putting green, fitness circuit, gymnasium, steam rooms, mini-mart, Laundromat and a children’s playground. Vacancies are low as the condo is extremely popular with Caucasian families and are a 5-minute drive to the Suntec City offices. Executive buses go direct to Suntec City and Raffles Place during peak office hours. 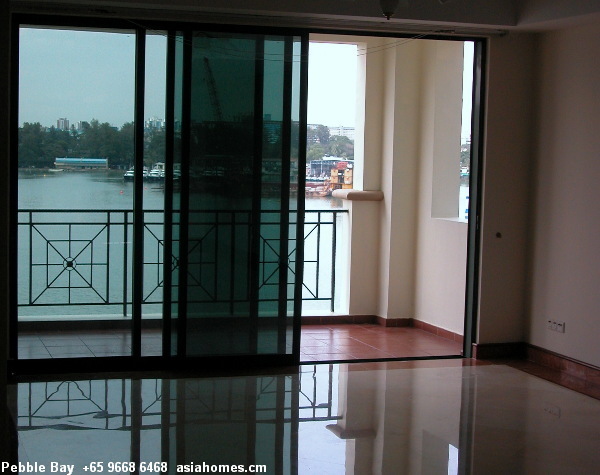 Water frontage, bigger balconies than most condos, high quality interior finishes. Rent asked tend to be higher than neighbouring condos like Costa Rhu as there is a great demand from the Caucasian community. 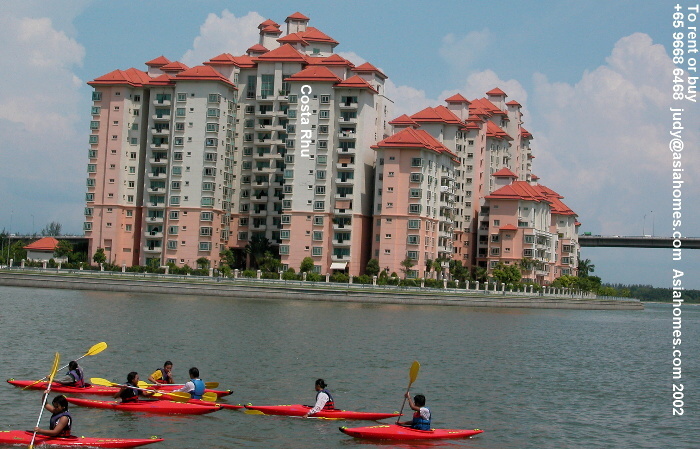 Pebble Bay's main water fronting competitor for expatriate tenants is Costa Rhu's Livonia block facing Kallang River. Direct water fronting. Unblocked view and river breezes. Balcony views of river. Master bedroom and 2nd bedroom and study face river too! Back view. 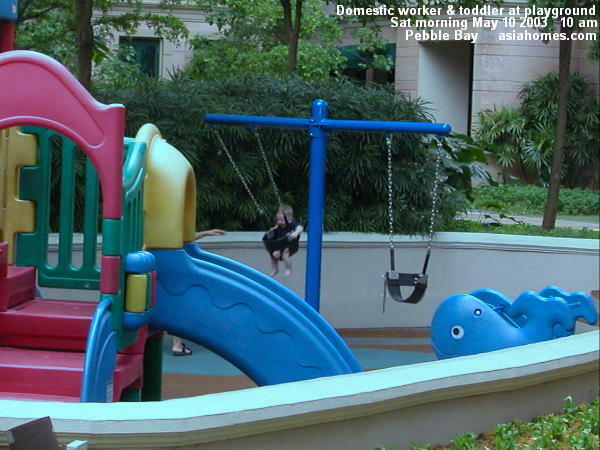 Near to playground & swimming pool. Blk 3, Lobby G 03-10 floor. Facing garden. Above car park entrance. Blk 3, Lobby G 06-06. 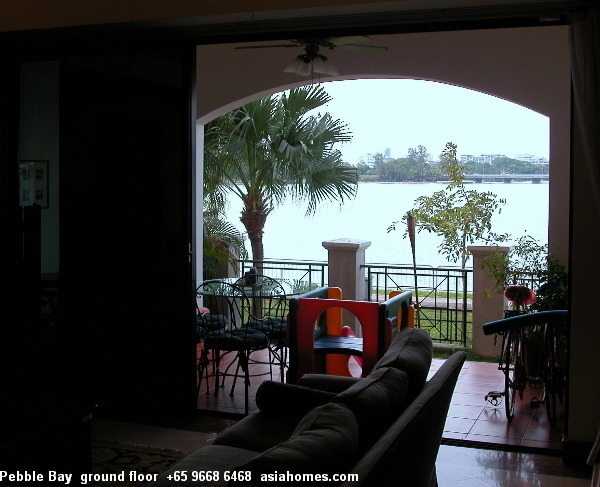 A strip of river view between 2 blocks from living area. Master bedroom faces Parkshore condos. Blk 3, Lobby G 08-06. 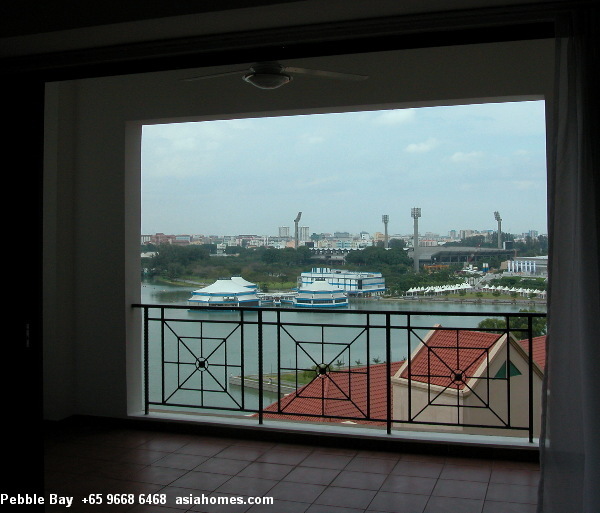 Facing roof top of opposite block but has a wider river view seen than in above unit. Blk 3, Lobby G 11-05. 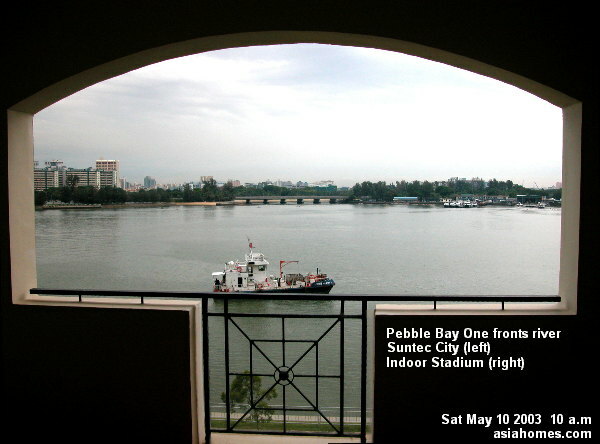 Panoramic river views with the Indoor Stadium on right side. Blk 1, Lobby E, 01-07. Master bedroom & study room face river. Back 2 rooms are dark. Blk 1, Lobby B, 05-05. American-sized fridge has to be kept inside a store room as the kitchen is too small. The door will not be opened fully if such a big fridge is installed. 1. Pebble Bay 3+1 2088 sq ft renovated. High occupancy rate. Other units may be available. 1. 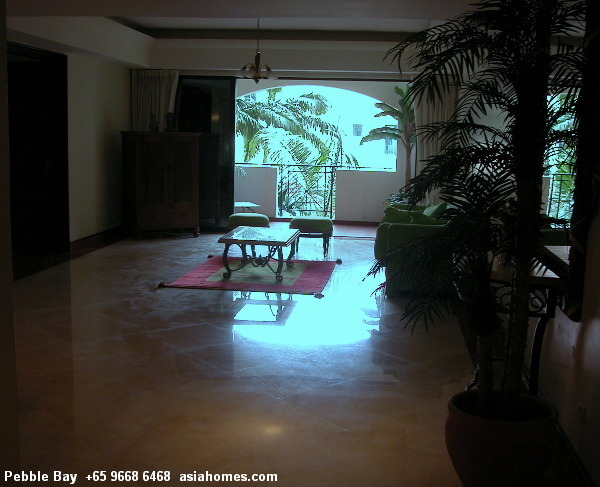 Casuarina Cove 3+1 1539 sq ft, renovated. 10. Fortredale 2+1 1400 sq ft (large master bedroom). One-year lease. High floor. Full sea view. 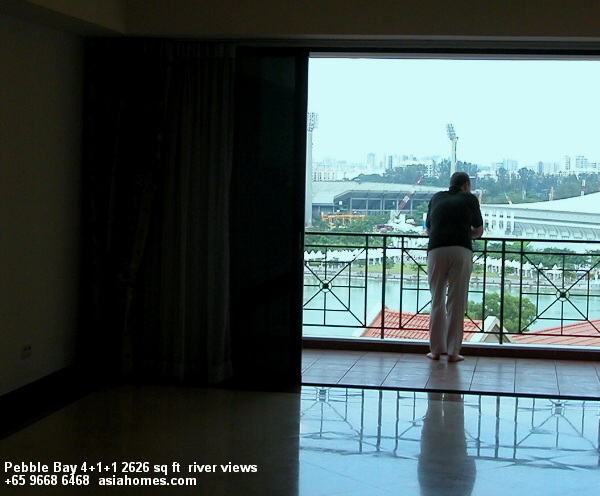 Dec 18 2001 Pictures - 2-bedroom Pebble Bay unit, Suspension Bridge, Indoor Stadium, Sanctuary Green & Water Place condos under construction. 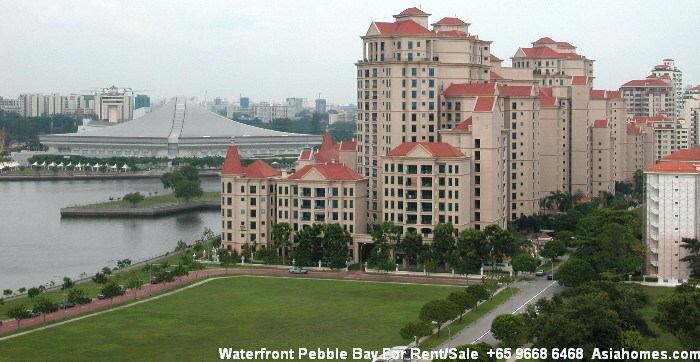 Pebble Bay 2-bedroom units for rent & picture of golf driving range. Images of interior from a top floor $14,000 "penthouse"
Research report on Pebble Bay with internal floor areas of all the units. Image from Costa Rhu condo's Livonia & Charonia block.